President Donald Trump in Peosta. President Donald Trump today said the United States “has all the cards” as his administration seeks to re-negotiate trade agreements around the globe. Trump struck a deal with a top European Union official yesterday (Wednesday) with the ultimate goal of erasing all tariffs between the U.S. and the E.U., but in the near term, Europe is to buy billions of bushels of U.S. soybeans. Trump visited the Northeast Iowa Community College in Peosta today for a round table discussion about workforce development. Trump brought a new version of his campaign hats to the table. 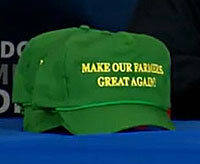 “It’s the John Deere colors, actually,” Trump said, holding the cap up for the crowd to see. 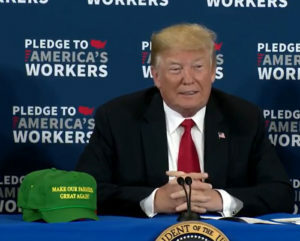 Trump told the crowd he is “taking care of your ethanol,” too. Trump arrived at Dubuque airport late this morning and shook hands with supporters who were waiting for Air Force One to land. The president also met with the mayor of Marshalltown to discuss its recovery from last week’s tornado. Later, during his remarks at the community college, Trump mentioned the tornadoes that struck Marshalltown, Pella and Bondurant. A crowd of protesters, many with posters critical of Trump’s trade policies, and supporters were outside the entrance to the community college campus when the president’s motorcade arrived.